This past week we’ve seen the tragic consequences of what can happen when a trusted leader loses the moral authority to lead. Yesterday was the first time in 46 years that Penn State University played a football game without Joe Paterno as the head coach. Paterno spent 62 years building his career at Penn State, only to see it crumble in an instant as a result of one critical failure of judgement. Joe Paterno is a Hall of Fame coach for good reason: Two national championships; five undefeated seasons; 23 top-ten finishes; 24 bowl victories (most ever); 87% graduation rate for his players; 409 victories (most ever); and 548 games coached, second only to the legendary Amos Alonzo Stagg (578). Joe Paterno and Penn State have been known as a model of stability and ethical behavior. In this day and age of recruiting violations, player misconduct, and booster improprieties, not once has Penn State been under NCAA sanctions during Joe Paterno’s leadership. Since he joined the Penn State coaching staff in 1950 (12 U.S. presidents have served during this time! 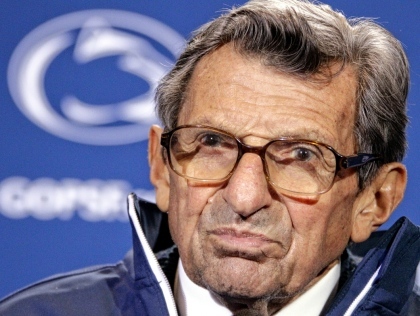 ), Paterno has risen to demigod status within the state of Pennsylvania and in the world of college football. Given this background, you can see why the child molestation scandal involving former coach Jerry Sandusky, and Paterno’s role in not fully investigating and reporting the alleged crimes to the proper authorities, has shaken Penn State and the college football community to its core. As a father of two sons, a coach of youth sports, and a student, practitioner, and teacher of trust-based leadership, I’ve been disgusted and disheartened by what’s happened at Penn State. The blatant abuse of power by those in leadership and the lack of concern for the children victimized is absolutely inexcusable. It’s been an utter failure of institutional leadership that warranted nothing less than the removal of those who presided over these events. 1. Leaders are held to higher standards. The Holy Scriptures capture this idea perfectly in Luke 12:48 “From everyone who has been given much, much will be demanded; and from the one who has been entrusted with much, much more will be asked.” Joe Paterno’s error in judgement came in believing the extent of his responsibility stopped at informing his athletic director of the alleged illegal activities. It seems unfathomable that Paterno would not recognize the severity of the wrongdoing involved in the actions of his former coach, but it was his responsibility as the leader of the football program to personally see these allegations fully investigated. When one of our team members brings a problem to us, particularly one that may involve illegal activity, it is our responsibility to notify ALL the appropriate authorities, and not try to minimize our personal responsibility by passing the buck to someone else. 2. Leaders are accountable for what happens on their watch. Yes, you are your brother’s keeper. When a problem occurs on your team, you are ultimately accountable whether you were personally involved in the situation or not. Leaders don’t have the privilege of enjoying all the benefits of being in charge without accepting the responsibility that comes with it. This is the exact reason that it was appropriate for Joe Paterno to be fired (along with other university leaders). I’ve read articles that have tried to excuse Paterno’s accountability by justifying that he did his part by informing his athletic director. That is really beside the point when it comes to accountability. The football program and all the activities and people associated with it were ultimately under Paterno’s stewardship. The buck stops with him and it stops with all of us as leaders. It may not seem fair, but it’s reality. 3. Leaders have a moral obligation to protect those in positions of low power. The most disturbing issue in this whole scandal is the lack of concern given to the victims, those young boys powerless to protect themselves. I believe that being a leader, whether as a coach, parent, or manager on the job, comes with a sacred trust. Leaders are placed in positions of power that comes with a duty to protect and care for those under their charge. The leaders at Penn State violated this sacred trust. Power has the ability to cloud our judgement and cause us to misplace our priorities. One can surmise this was the case at Penn State. Those who were victimized were essentially ignored in an effort to protect the university’s reputation. Leaders have a moral obligation to give voice to those who don’t or can’t have their own. A bright light in this situation is that the newly appointed president of Penn State, Rodney Erickson, recognizes the task of rebuilding trust that lays ahead of him. In both video and written messages to the Penn State community, Erickson has stated that he will lead the university to reorient its culture and restore the moral imperative of doing the right thing. He has expressed remorse and support for those victimized and has committed to actions that will lead to greater transparency and trust in the future. What are your thoughts about the Penn State scandal and its implications for leaders? Feel free to leave a comment. You’re assuming the only facts worthy of knowing are containined in a cherry-picked Grand Jury report.. You base your conclusions on hollow information at best…how about writing a column about the importance of allowing due process and hearing all the facts before writing a column about an asinine unfounded opinion? Hi Greg. Thank you for your comments and opinions. I respect your point of view. Due process is essential to bringing resolution to this case and hopefully justice will be served for all involved. My article is based on the Grand Jury report and other news and media articles, which at this point in time, is the only information we have available. I think it’s telling that Joe Paterno himself admitted that he wished he had done more when he learned of the alleged abuse. The main point of my article is that there is a moral component to leadership, and when a person doesn’t recognize, accept, or abuses that moral responsibility, the effectiveness and validity of their leadership is severely compromised. The Penn State scandal is a tragedy for all involved, especially the children that were involved (should these charges turn out to be true). It’s unfortunate that a distinguished leader like Joe Paterno will have his legacy tainted by these events and hopefully it will serve as a warning to all of us in leadership positions that we have a higher level of responsibility and accountability that we have to live up to.